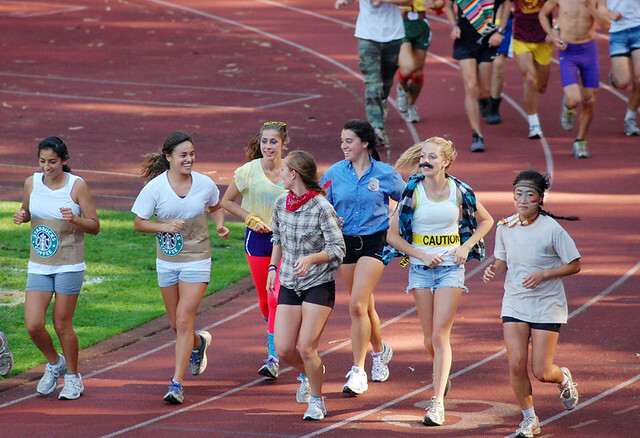 The SF State women's cross country team, followed closely by the men's team, run in costumes at the Throw-A-Fit fundraiser at Cox Stadium, Friday, Oct. 28. Photo by Cindy Waters. A ballerina in a blue wig, superwoman and others joined forces Friday at Cox Stadium to throw javelins and discuses to raise funds for the throws squad at SF State. The all-female throws squad, part of SF State’s track and field team, dressed in costume to host the first-ever Throw-a-fit, a fundraiser designed to raise money for scholarships for members of the team. The event raised more than $600 for the team. Sponsors pledged ten cents per foot, and were also given the option to donate a set amount of $25. Each team member stated a total number of feet they hoped to throw, ranging from 200 to 500 feet. The throwers had two chances at each event to accumulate their projected total. The events consisted of javelin, discus, hammer, shot put and 20-pound weight throw. Luisa Musika, a senior, had 10 sponsors for the fundraiser, the most on the team. Musika, who has been with the team four years, placed second last year for the discus throw at the NCAA Division II Championships. She has also won all-conference awards the last three years. The money raised from the “Throw-a-fit” will be awarded as scholarship money for female throws athletes. Those who will receive scholarships are chosen by how well they perform at the California Collegiate Athletic Association and how much they have improved over time, McKinstry said. Typical scholarships cover about 40 percent of a full-ride scholarship. Overall, McKinstry said she and head coach Terry Burke decide who is most deserving of scholarship money. McKinstry said after scholarships are allotted, leftover money is used for other team purposes. Another fundraiser ran next to the Throw-a-fit event: the Lap-a-thon hosted by the cross-country team. The Lap-a-thon raised $1,000 by Friday, and head coach Tom Lyons expected to double that by the end of the semester through other donations. Lyons said donations range anywhere from $5 to $200, made either per lap or at a flat rate. Lyons said the money raised has no specific purpose, but it goes back into the program to provide for unspecified needs. Both Lyons and McKinstry said the fundraisers provided a fun way for the teams to raise money through team bonding.